The Chocolate Goddess enjoys a good chocolate salad. 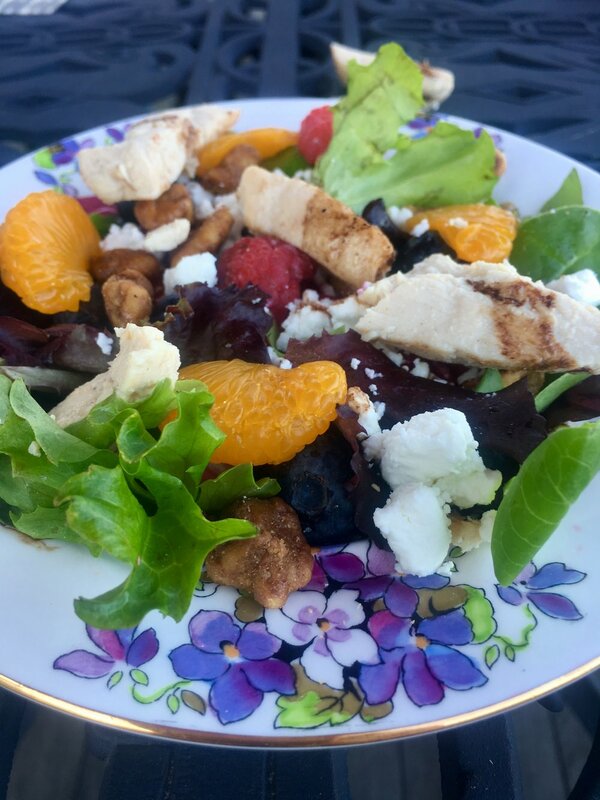 The taste and health benefits of berries, goat cheese, mandarin oranges, mixed greens and chicken are improved with the healthy addition of chocolate curls are complimented and enhanced with a delicious chocolate balsamic vinaigrette. The health benefits of chocolate are numerous. Why adding chocolate to a salad hasn’t been done before is bewildering. Chocolate is decadent, but it is also healthy. A little naughty can be nice. Some say chocolate is a fruit, others a vegetable or bean - but no matter which way you eat it, know chocolate is very nutritious. Dark chocolate is superior health wise because it has less sugar and milk. The food of the goddesses lowers blood pressure, lowers the risk of cardiovascular disease, improves brain function, is a powerful antioxidant, lowers LDL and improves HDL cholesterol. Last, but definitely not least, a really important Chocolate Goddess point, it protects against aging! So eat your chocolate and have some fun with your family and guests! Chill Cookie Sheet in freezer for 30 minutes. Break up chocolate and slice butter into a medium size microwaveable glass bowl. Leave approximately 2 tablespoons of chocolate pieces aside in reserve. Microwave on low power 3 stirring every 30 seconds, until chocolate is just melted. Mix in reserved chocolate and stir until melted. Spread on the bottom of a large cookie sheet and let partially set. Using a flat edged surface like a clean scraping tool, metal spatula or knife (the size of the blade will give you the size of the curl), push away from you to create curls. Chill on a sheet in the refrigerator. Alternatively for a simple method, place a chocolate bar on a piece of waxed paper and heat in microwave on low power 3 for approximately 4 seconds. Scrape sides of bar with a vegetable peeler. They will not be as stunning in appearance but will still make for an exciting salad topper. Make sure to chill in refrigerator. Mix all the dressing ingredients in a mixer and blend on low until combined. We aren’t going for milkshake here, just blended. You could also shake in a jar with a lid. This a glamorous salad, it is all about posing the ingredients for that wow effect. Start with your greens and then slowly place all the other ingredients, spooning them on evenly. Give balsamic vinegar a vigorous shake and drizzle with a spoon on top of the salad in a few spots. Put the rest of the dressing in a pretty bowl for your family or guest to spoon on extra.